As I’m focussing my research on the “Circle of Courage,” I stumbled upon the STARR website which is dedicated to the mission of creating positive environments where children and families flourish. This organization specializes in residential, community-based, educational and professional training programs that build on the strengths of children, adults and families in communities around the world. The “Circle of Courage,” came from the book “Reclaiming Youth,” which is a holistic program based on traditional Aboriginal ways of knowing, personal development and community values. In 1997, this website founded Reclaiming Youth International (RYI) which offers strength-based training to professionals such as teachers, counsellors, social workers, psychologists and others working with children and youth to become resilient. 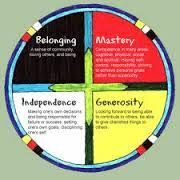 RYI’s uses the “Circle of Courage,” to identify the four universal needs of every child: belonging, mastery, independence and generosity. This model is trauma-informed and resilience-focused. Many Indigenous children around the world face challenges daily, including: drugs, violence, gang activity, conflict, trouble in school, and so much more. The model is designed to encourage kids to feel safe and comfortable in an environment of understanding and acceptance. 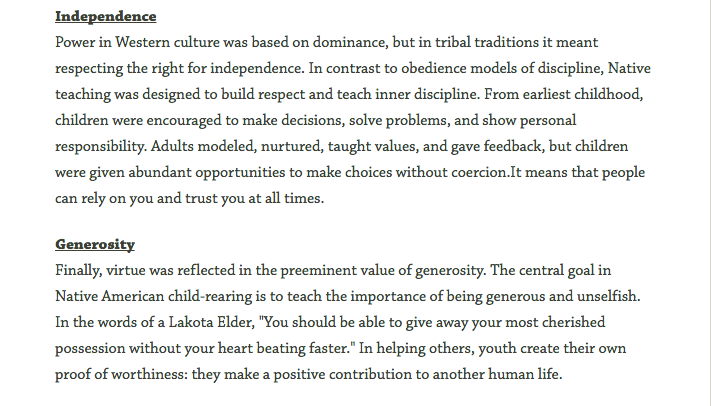 When researching about Reclaiming Youth at Risk, I began to look into the co-author of the book, Dr. Martin Brokenleg. Dr. Brokenleg co-developed the Circle of Courage model and provides worldwide training for individuals who work with children/youth at risk. He is a retired professor and was most recently Director of Native Ministries and Professor of First Nations Theology at the Vancouver School of Theology. The following website is a list of publications that he wrote: CLICK HERE. Dr. Brokenleg has talked about the following topics: Reclaiming Youth at Risk, Growing Your Own Kids, Intergenerational Trauma, Creating a Positive Youth Culture, Building Strengths – Early Childhood, Culture in Classroom, and many more. Since my topic for the final project focuses on Reclaiming Youth at Risk, I will provide a short blurb about the story and an informational video of one of his talks. For thousands of years, American Indian cultures nourished respectful and courageous children without employing punitive discipline. Now, recent youth development research is revealing the essential elements in raising confident, caring children. Drawing on his research with Drs. Larry Brendtro and Steve Van Bockern in their book, Reclaiming Youth at Risk, Dr. Martin Brokenleg presents information on the Circle of Courage which offers concrete strategies for creating environments in which all young people can grow and flourish. Dr. Brokenleg has a resource page that you can access on his personal website: martinbrokenleg.com/resources where you can access more information about his workshop opportunities and presentation slides. School District 27 (Cariboo/Chilcotin) in the Central Interior of BC put forth an informational video which features Dr. Martin Brokenleg talking about how educators can use the Circle of Courage in their classrooms. At the 2:45 mark of the video, it begins to explain the Circle of Courage model. I am still working towards selecting a particular area of interest for my research but two seem likely. The first is based on my recent experience teaching in an alternative learning center. I work with at-risk youth and a disproportionately large number of our students (45%, far greater than the % of students throughout the district) are identified by the school district as having Aboriginal ancestry. 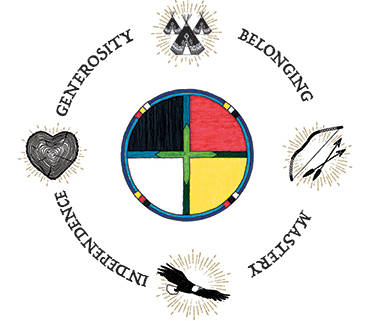 We spend a lot of our time making social and emotional connections with the students and follow many of Dr. Martin Brokenleg’s Circle of Courage teachings. 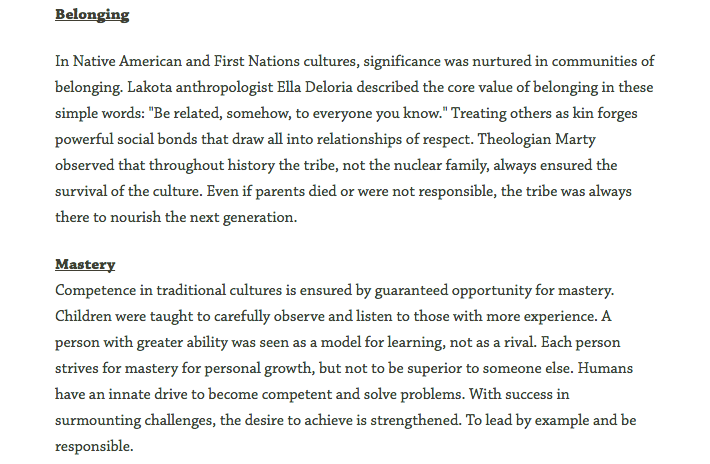 These teachings apply to all at-risk youth as many of them, Aboriginal or otherwise, feel a great disconnect with the community around them and this has, in many ways, contributed to their educational and life struggles. The second possible theme of interest to me is based on 16 years experience teaching science and math based on curriculum that very much views aboriginal content as an add-on (something that became very obvious to me while marking the solar system module in a grade 8 science workbook last week). While the new BC Curriculum offers hope for improvement by allowing a more constructivist approach to teaching and learning teachers still need to reflect upon and embrace change if it is to be successful. This link will take you to a PDF file that outlines the key developmental needs of children as presented in the Circle of Courage: Mastery, Belonging, Generosity and Independence. These needs are compared to the value system set up by Western cultures and the importance of each is outlined. This is a great starting point for those interested in adhering to the philosophy “it takes a village to raise a child” and developing this culture in their classroom. A beautiful poster and summary can also be found by clicking the link. This website contains information about cultural healing and resilience. It is a great place to start for those looking for an understanding of the issues faced by Aboriginal populations and the role that educators can play in helping to overcome some of these issues. The website has links to articles, power points from presentation, and Dr. Brokenleg’s summarised thoughts on different topics of interest. This article discusses the power differential that exists for Aboriginal students in a science classroom. Practical research that offers an alternative approach that moves away from “enculturation” is introduced and a new way of teaching science is presented. In this new approach teachers “play the role of a tour-guide culture broker” making clear to students the language that they are speaking (western science or Aboriginal science) so that students can move between the two languages without one being seen as superior to the other. This website out of Cape Breton University helps us to “view science in a broadened and culturally inclusive way”, and is guided by the principle of Two-eyed seeing. The website has a vast array of resources to support a changing view of science education that have to be seen and explored to be believed. This is a great website/blog out of UBC for anyone who is hoping to introduce Aboriginal ways of knowing into the Math curriculum. There is information on symposiums, ideas and lessons, and resources to support teachers. Though the primary contributor seems to be Cynthia Nichol, this webpage offers hope to those of us who need some guidance with authentic ways to incorporate Aboriginal ways of knowing into the math curriculum. It offers an amazing platform for knowledgeable individuals to share ideas and resources to support educators. In my school, we have used the Circle of Courage woven throughout everything we teach. It was developed originally as a program to help at-risk First Nation students to avoid issues like alcoholism, drop-outs, ect. The main tenets are Belonging; Mastery; Independence; and Generosity. It was found that those students most connected to these tenets had more success. This site offers more information about the Circle of Courage and resources.